Easy Homemade 50 watt Power Inverter (UPS Uninterruptible power supply) is a very useful device which can convert Low voltage from a DC source to high voltage AC. The most common power inverter is 12V to 240V inverter. Perhaps that is because 12V batteries are common. This type of power inverter usually draws current from a DC battery. This battery should be able to provide a high flow of electric current. Normally lead acid batteries can server this purpose well. 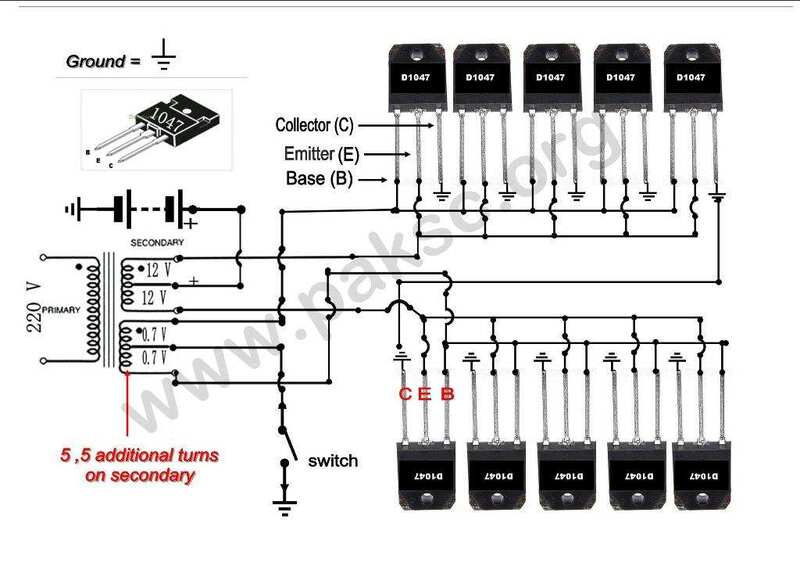 This current is then converted to 240V square wave alternative current so that we may empower those electric appliances which work on 240V instead of 12V. Inverter falls in the category of expensive devices so many people don’t buy them even they need them. What if I tell you how to build an inverter (UPS Uninterruptible power supply) yourself? 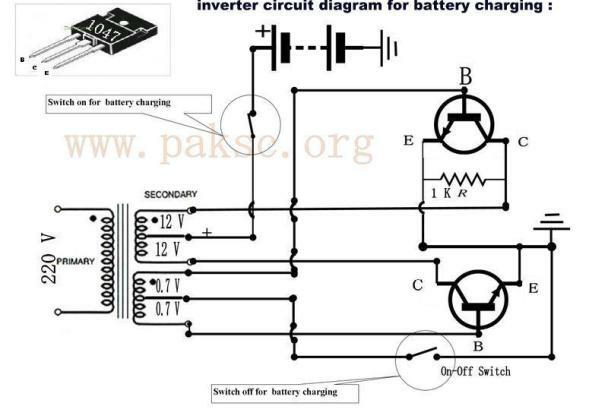 There are a lot of inverter circuit diagrams available online; some of them are complex and others are low performance. I designed my own inverter circuit which is comparable to any professionally made inverter but still is simple enough for you to try. Watch Video Easy Homemade 50 watt Power Inverter with complete instruction . connect the E of both sides of transistors with the outer terminal of secondary coil, after that connect the both outer terminals of the third coil with the base of the both heat sinks of transistor. then connect the collectors of both side by wires n then connect the 500 ohm resistor on emitter and resistor on either side. Now connect the middle terminal of primary coil by one to two ft long wire and clip (crocodile) it and attach this terminal always by the positive terminal, and with the negative terminal of battery connect the both collectors of transistor. After that the central point of the third coil and a wire attach it with emitter to connect using a heavy ampere switch between both terminals of the Inverter primary coil to apply a capacitor which will prevent the current from the sparking. inverter will switch on as soon as starting to work. Easy Homemade 50 watt Power Inverter With both the terminals of battery connect the positive and negative wires to its terminals positive to positive and negative to negative and then open the switch, slightly vibration starts in the inverter as switch is open. Now you can run it into 1 to 500 watt load. This inverter also can charge the batteries, you just need to( on and off) the switch. You will need to switch off for battery charging and connect the primary coil indirectly with 220 V of power supply, after that battery will start charging. To converts it into UPS you needs only one relay. These relays are AC 220 V and 4.4 terminals. 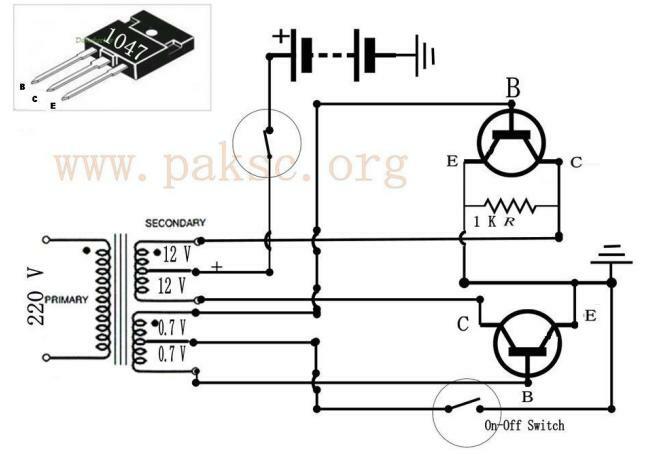 How to find emitter base and collector of D1047 Transistor? Difference between Voltage-Amps (VA) and watts ?